Big-box retailers often have the resources, product variety, and name recognition to get ahead of smaller competitors. However, small and midsize businesses are able to crush the big-box stores where it matters most—the customer experience. 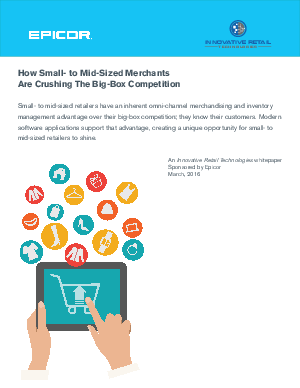 This white paper—written by Innovative Retail Technologies and sponsored by Epicor—explains how the right software solution leads to a more agile retail strategy, which then leads to a better experience for your customers.